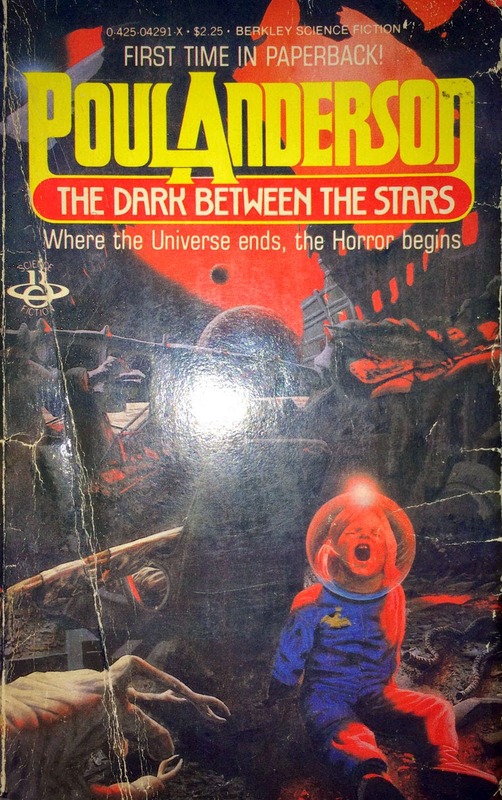 Today on "History's Most Deceptive Book Covers," we examine Poul Anderson's 1981 collection of short stories, "The Dark Between the Stars." Are the contents as chilling as the books macabre cover promises? "Where the Universe ends, the Horror begins," claims the tagline, hovering over the foreboding tableau of a young girl astronaut, seemingly the only survivor of a spaceship crash, about to be devoured by some horrifying alien monster. The universe ends in none of the stories in this collection, and while one or two of the stories contain a dab of horror, it's of the mildest sort. A couple of the stories have downer endings, a few others are ambiguous, and at least three of the stories have very happy endings indeed - one ends with a wedding proposal right out of 1950s romantic comedies. Still, the title's collection is wonderful, if misplaced. And the cover art is laughably off-base. It's interesting that even Poul Anderson, a powerhouse of SF in his day, wasn't able to command a more appropriate image. Perhaps he just didn't care.